Is the AU way ahead of its time? Or is this just a desperate measure to find alternatives for Africans who are so eager to leave their own countries that they risk life and limb to settle elsewhere? In the final decisions and declarations of the summit, heads of state and government officials committed to a number of actions to ‘accelerate mobility and integration on the continent’. These include speeding up the implementation of visa-free entry and visas on arrival for Africans; ‘offering the same opportunities’ for Africans within RECs by 2018; and speeding up the implementation of a so-called African passport. Heads of state also undertook to harmonise higher education, and to encourage exchange programmes so that skills and knowledge could be shared on the continent. Meanwhile, two areas of focus were identified to address the tide of migrants losing their lives while travelling across the Mediterranean and the Sahel: first, the commitment to combat human trafficking and second, solving the problem in Libya – not an easy task on all accounts. The decision of the Assembly to accelerate free movement on the continent came after discussions among leaders that took place behind closed doors on the first day of the summit. In an unprecedented move – even before the formal opening of the summit, on Sunday 14 June – AU Commissioner for Social Affairs, Sidiki Kaloko, gave a briefing on migration. South African President Jacob Zuma also briefed his peers about the xenophobic attacks in April this year. According to sources, Zuma told fellow leaders in the closed session that South Africa is assisting victims of xenophobia; that it is trying to forge a pan-African spirit through, for example, the celebration of Africa month, flying the AU flag and teaching schoolchildren the AU anthem; and that those involved in crimes against foreigners will be dealt with. He denied that the controversial ‘Operation Fiela,’ which saw many illegal immigrants rounded up in April and May this year, was specifically targeting foreigners and said South Africa is developing a new international migration green paper to be ready for comment early next year. Discussions at the summit showed that some AU member states believe open borders could help to remedy the crisis of thousands of Africans dying in the Mediterranean or the unforgiving Sahara desert. The argument is that if there were more opportunities on their own continent, people would not want to migrate to Europe or elsewhere. Of all the RECs, the Economic Community of West African States (ECOWAS) and the East African Community (EAC) are the most advanced in terms of the free circulation of citizens. Free movement for ECOWAS citizens across all 15 member states has been in place since 1979. This didn’t come about easily. In fact, it was only implemented after the devastating expulsion of Ghanaian citizens from Nigeria and vice versa in the mid-1980s. The example of West Africa has shown that fears of one country being overrun by another if free movement were allowed are largely unfounded, says Zounmenou. ‘West Africans realised the importance of a visa-free zone, and others should do the same,’ he says. Periodically, as was the case with the Ebola outbreak in Guinea, Liberia and Sierra Leone, borders are closed – but in general West Africans have seen that free movement has more benefits than negatives. In East Africa, citizens can move between the five members of the EAC with only identity documents. Security threats in the area have, however, hampered progress towards free movement. For example, so far only Kenya, Rwanda and Uganda have signed up for the single East African tourist visa, while Tanzania and Burundi have opted out for security reasons. Given constraints such as security and xenophobia in some places on the continent, is it realistic to expect countries to throw open their doors for other Africans? According to a 2013 African Development Bank (AfDB) study, only a very small minority of countries allow visa-free entry to other Africans. At the time of the study, this included Rwanda, Seychelles, Mozambique, Madagascar and the Comores. Countries like the Democratic Republic of Congo and Equatorial Guinea require visas from every single African country. The AfDB has urged countries to relax visa requirements to promote investment and intra-African trade. It meanwhile acknowledges that improving continental infrastructure is one of the greatest challenges to promote trade among African countries. 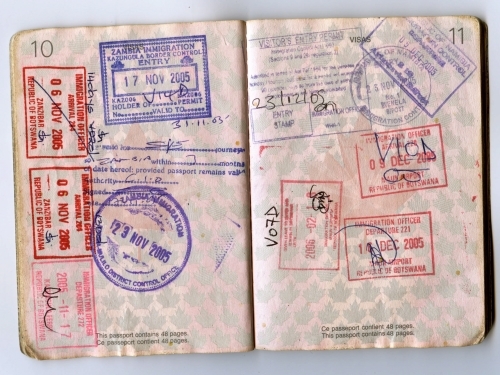 Zounmenou added that for many countries, visas are an important source of foreign currency. Visas cost up to US$150 per person in some cases, and many states believe they can’t do without this resource. In addition, opening up borders is not politically feasible in a country like South Africa, where there is a prevailing belief that foreigners are taking jobs away from locals. ‘Regions like SADC [the Southern African Development Community] are unlikely to adopt the [AU] measures,’ says Zounmenou. The AU is certainly aware that this call for open borders has fallen on deaf ears many times before. The idea of an African passport has surfaced periodically at AU summits – the last time being at the July 2007 summit in Accra, Ghana – but it has never become a reality. Former Libyan leader Muammar Gaddafi, one of the great supporters of free movement in what he termed as the United States of Africa, was repeatedly voted out when he tried to push forward this idea before his death in 2011. For now, the AU has asked foreign ministers of member states to organise a retreat to discuss the issue. This is ahead of a major European Union-AU summit to be held in Valetta, Malta on 11 and 12 November this year. Around 85 delegations from origin, transit and destination countries are invited to attend the summit, according to a EU policy document. The AU has also asked the ministers to develop a protocol on the free movement of persons. But it could still be a long time before this is drafted and adopted by all of Africa’s 54 countries. It seems an African passport that would allow free movement is a good idea whose time has not yet come. Liesl Louw-Vaudran is an ISS Consultant.